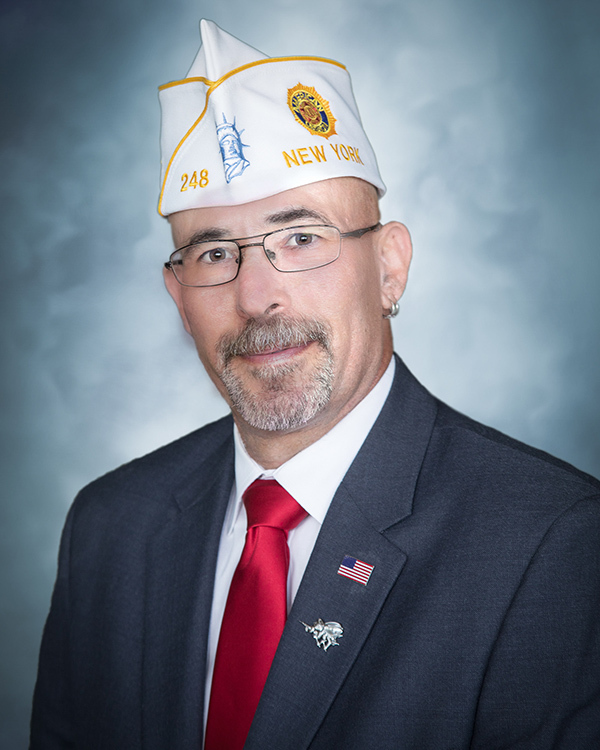 Gary Schacher of Cobleskill (Schoharie County) is the first Iraq war veteran to become commander of The American Legion Department of New York. His election came just before the conclusion of the 100th Department Convention, held July 19-21 in Rochester. A member of Timothy Murphy Post 248, Schacher enlisted in the U.S. Navy in 1980 and served in the Persian Gulf region before being released from active duty and joining the Naval Reserves. As a reservist, he served with a Weapons Station Unit and a Mobile Inshore Undersea Warfare Unit before transferring to the Navy Seabees in 1990. He was promoted to chief petty officer in 1996 and recalled to active duty in 2003 and 2004 for Operation Iraqi Freedom, serving with the Seabees in Fallujah. He retired from the Navy in 2006 with 26 years of service. Schacher received four Navy Commendation Medals, three Navy Achievement Medals and various campaign and unit medals. Schacher begain working for New York State in 1984 in various state agencies. A graduate of SUNY Cobleskill with an associate’s degree in computer science, Schacher was named student of the year in 1998. Since 1999 he has worked for NY State Police in the Information Technology and Investigative Application Support units. He managed the State Police IT Support Center from 2002 to 2012 and was honored as the state IT Manager of the Year in 2012. A Legion member for more than 26 years, Schacher has served in leadership capacities from the post to Department levels, and most recently was Department Membership chairman. He is also involved in the Sons of the American Legion and the Legion Riders. In 2017, he was inducted into the State Senate Veterans’ Hall of Fame. The commander was born in Suffern, NY, and lived in Rockland County until marrying his wife, Laurie. They currently reside in Cobleskill where they raised their two daughters.